Summary from Goodreads: Grace, tough and wise, has nearly given up on wishes, thanks to a childhood spent with her unpredictable, larger-than-life mother. But this summer, Grace meets Eva, a girl who believes in dreams, despite her own difficult circumstances. 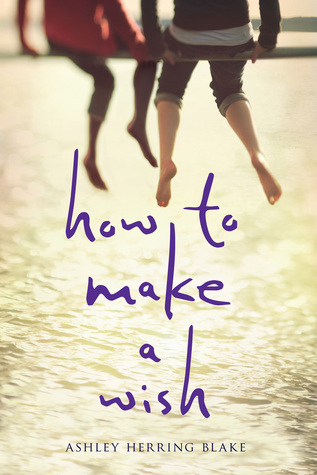 Oh I absolutely loved How to Make a Wish! The romance was so sweet, but the book went a lot deeper than that. It also had a lot to do with family issues, with Eva’s mother having recently passed away while Grace’s mother has been in bad shape for years now. I loved the diversity as well! Grace, the main character, is bisexual, and Eva, the love interest, is a multiracial lesbian. This book starts off with Grace moving homes yet again. She and her mom, Maggie, are constantly moving in with whoever her mom’s new boyfriend is. This time, it’s the father of her old boyfriend, Jay, who also posted a lot of rude stuff about her after their breakup. But then she meets Eva, whose mother recently passed away. Eva is living with Grace’s best friend, Luca, and his family. I really liked the main character, Grace! At times I found her to be kind of annoying, but not really. Most of the time she was just sticking up for herself. However she seemed to get really jealous at times. Other than that, I liked her as a character and I enjoyed reading from her POV! It was also really interesting to read from her perspective as she has to deal with what’s going on between her and her mother. On top of that, Grace was a skilled piano player. Though a small part of the book, I enjoyed it as well. Eva, the love interest, was probably my favorite character! Like I said, she’s biracial and also a lesbian. Her mother recently passed away and ever since she’s been having a really hard time and needs someone to be there for her. She’s also stopped dancing, as her mother was a ballet teacher. So now she’s living with Grace’s best friends family and is working at their diner, LuMac’s. I thought their romance was super sweet. I loved it! The book wasn’t entirely focused on the romance though and went a lot deeper, like I said. Eva and Grace met at the perfect timing, both of them needing someone to be there for them as their lives have turned pretty crappy. They started off as friends, sneaking up into the lighthouse Grace’s mother’s new boyfriend lives next to. I loved these scenes in the lighthouse and how they would talk for hours as friends before they really started to fall in love. The focus on family issues was also super interesting. Grace’s father died when she was two and ever since, her mom has just been getting worse and worse. She stays up late partying at clubs and is constantly coming home with new boyfriends. So Grace’s life is pretty hard with all of this. She loves her mom, but it’s hard for her. Ever since she was around 10/11, her mother has been taking her to these clubs and Grace has had to learn how to deal with all of this and act like the bigger person in this family. I’m also really glad with the way this is resolved and I think it was handled really well. Like I said, I really enjoyed reading from Grace’s POV and how she had to handle and deal with everything. I feel like I say this a lot in my reviews, but this writing wasn’t super beautiful or anything special. That doesn’t mean I didn’t like the writing style at all though, because I really did! The author deals with and portrays a lot of things really well. Overall, I loved How to Make a Wish! I have yet to read Ashley Herring Blake’s other book, but I definitely plan to do so now. I thought this was a really beautiful story, with the romance and all the other issues the main characters were dealing with. The author portrayed everything so well and I loved how everything was resolved and how it ended! I definitely recommend this book, especially if you’re looking for a contemporary romance that’s also a bit heavier and deeper at times.